Every body wants numbers and “science based” information to chart shale gas policy; but don’t confuse empirical data with objectivity in the context of the politicized and divisive debate over the merits of hydraulic fracturing. The reports look authoritative, presented in weighty volumes bearing the air of authenticity. Don’t be fooled. In quantifying the impact of Marcellus Shale gas exploration, the body of economic analysis is scattershot, conflicting and often suspect. The most flagrant example is the “Penn State Report,” first issued in 2009, which predicted the industry would generate over 175,000 jobs for Pennsylvania over the course of a decade. (The number was later updated to 250,000). The same report warned that the industry’s economic turbo boost was conditional, and could be “stunted by high taxes and costly regulations.” It had the whiff of rhetoric, and sure enough, an internal investigation by Penn State administration determined the “study” -- funded by the industry, authored by faculty members with industry connections, and baring the university’s seal -- was a product of industry boosterism that “may have well crossed the line between policy analysis and policy advocacy.” The Pennsylvania Department of Labor and Industry, meanwhile, projected that Marcellus-related jobs would grow statewide, rising from about 8,000 in 2006 to about 12,400 in 2016. Policy makers in New York have issued their own predictions. These were not funded by the industry, but a product of a report commissioned by the Department of Environmental Conservation. Ecology and Environment, the firm that got the contract, determined the shale gas industry would create between 6,000 and 37,000 jobs in New York. This would significantly increase the number of workers in New York’s gas industry, which stood at 448 in 2010, but would represent only a crumb of the state’s economic pie. (Approximately 351,130 persons were employed in the travel and tourism sector in New York State in 2009; and 2.4 million in the education, health and social services.) The difference between 6,000 and 37,000 thousand is pretty big, and it should be noted that the report did not attempt to derive more specific projections “given the large uncertainties associated with the future natural gas market, the economic and demographic disparities between different parts of New York State, and other unknown factors that would influence the development of the natural gas reserves.” Most recently, John Campbell of the Press & Sun Bulletin reported that the DEC committee that commissioned the economic study has ordered a study of the costs associated with fracking to go along with it. In this day when vast stores of information are more accessible than ever with a few keystrokes, isn’t ironic that consensus on the matter is so elusive? We are left with numbers that really point to an absence of information. This is not surprising, given the shale gas experiment is still in its early phase. There is little in American history with which to compare it, beyond the mineral extraction and natural resource booms of a bygone era that cannot be neatly removed from their 19th and 20th century context and applied to 21st century scenarios. 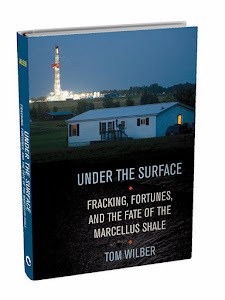 The Marcellus Shale economic studies are far from worthless, however. To the extent they provoke public debate – the real stuff on which policy should be derived – they are helpful, and they seem to be doing just that. Fracking: Love Canal of the 21st Century?